Hi, I am interested in your 1962 Ford Galaxie (stock #5164-CHA) listed on Autotrader for $29,995. I'd like to get more information about this vehicle and confirm its availability. An amazingly preserved, original example of a top-of-the-line, full-size Ford is something to really notice. After all, this 1962 Ford Galaxie 500XL coupe has great all-original color, and its original 352 V8 with only 20,094 miles on it. So we know youre going to win survivor awards with this one. You hardly ever see them like this. 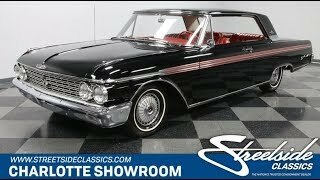 Over half a century later, and this Galaxie still looks showroom fresh. The Raven Black paint is the same that was applied by the at the St. Paul plant all those decades ago, and today it still has the kind of luster that will attract a crowd. This coupe was the pride of a private collector for many years, which is how you can get such a low-mileage survivor. But more than just great paint and body, the details are correct, too. Thats also why the bumpers have a mirror shine, the intricate grille is complete, and the sporty full-length side trim is still race-ready. Its such a complete and pristine package that the original factory wheel covers still brightly show the insignia that matches the badging on the base of the pillarless hardtop. The factory-correct red interior received just as much preservation attention as the exterior. So everything inside is fresh and bright like a 1962 time machine. This level of care is fantastic to see in the top-of-the-line, full-sized Ford because theres plenty of great bright trim incorporated into the weave of the door panels and seats to makes this a very cool place to send some time. Bucket seats are rarity in these family-style Galaxies (they only came in the XL,) so youll really enjoy the individual comfort that even comes with a stylized center console. The three-spoke steering wheel with bright inner trim is a vintage Ford favorite, and its set in a machine-turned panel thats another XL exclusive. As you gaze across the dash, you truly realize the level of care in this car with everything from the AM radio to the heat/defrost controls in remarkably well preserved condition. The huge trunk even has the correct mat and a full-sized spare thats probably this cars original rubber! Open the hood for a true treat. The original 352 cubic-inch V8 is authentic right down to the bright blue valve covers and air cleaner. You even get factory stickers and the FoMoCo coolant bag. This is the kind of overall execution that impresses car show crowds and the judges, too! But the coupe is more than just for showing off. This V8 is the ideal early 60s powerplant, both brawny and refined, making the performance seem almost effortless. In fact, one of the few items that were ever replaced was the dual exhaust system. This was just so that this classic could truly be driven. And its a coupe worthy of going the extra mile with power steering, a three-speed automatic transmission, and modern Hankook tires at each corner. So while this surviving classic might have only averaged less than 370 miles per year, youll have no trouble adding to that tally on your own if you decide. This survivor even comes with the original owners manual and other materials meant for the first owner. You know you will likely never find another preserved classic this nice ever again. So if youre a true automotive connoisseur, hurry up and call today!